John W. O’Neal Jr (“Bill”) 97, went to be with the Lord November 21, 2018. He is preceded in death by his wife Ruth Clancy O’Neal, his parents John W. O’Neal, Sr., Vivian Byrd O’Neal, brother’s Walter O’Neal, James O’Neal, Herman O’Neal. He is survived by his sons Ronald P. O’Neal (Rose) and Marc T. O’Neal (Lauren), sister Florence O’Neal Jarrell; grandchildren Kellee L. O’Neal, Daniel P. O’Neal (Amber), Erica J. O’Neal, J. Chandler O’Neal, Anna K. O’Neal; great grandchildren Ashlyn Bergen and Gavin O’Neal; nieces Jean O’Neal Davis, Sue O’Neal Pope (Bill) and nephew Hugh O’Neal, extended family and friends. Bill was born July 29, 1921 in a farm house in Reynolds, Ga. He graduated in 1939 from Reynolds High School. 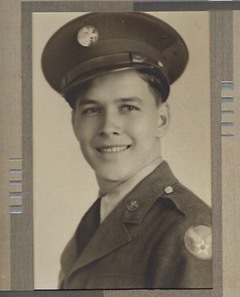 He went on to work for Sheffield Hardware in Americus until joining the Army Air Corps in 1942 during World War II. He served in the Pacific until the war ended and was honorably discharged as First Sergeant attached to the 47th Fighter Squadron 15th Fighter Group. Bill went on to attend the University of Miami earning his bachelors degree and then Northwestern University earning the Master of Business Administration. He joined the General Electric Company in Schenectady, NY. He held several posts with GE in Schenectady, Chicago, New York City before being moved to General Electric Credit Corporation in Connecticut where he retired after 33 years. Bill and Ruth retired to Alpharetta, Ga. Bill authored a book on his life and times and spent his long active retirement loving his family and friends. He loved being an active member of St. Benedict Catholic Church and the Knights of Columbus. The family will hold a visitation 6-8p Monday November 26 at the Roswell Funeral Home in Roswell, Ga with a Memorial Mass at St. Benedict Catholic Church in Johns Creek Ga at 10:30a Tuesday November 27. Interment will be Saturday December 1 at 2:30p at Crowell Cemetery in Reynolds, Ga.